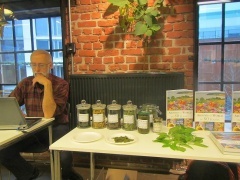 Mot en Norsk Spiselig Flora / Towards a Norwegian Edibles Flora | Edimentals ! Previous PostCloud jetNext PostEvents in 2019 with the Extreme Salad Man! Pingback: Svartelistet matplanter | Edimentals ! Pingback: Om Spiselige Norske Fremmede Arter / About edible Norwegian alien species | Edimentals !